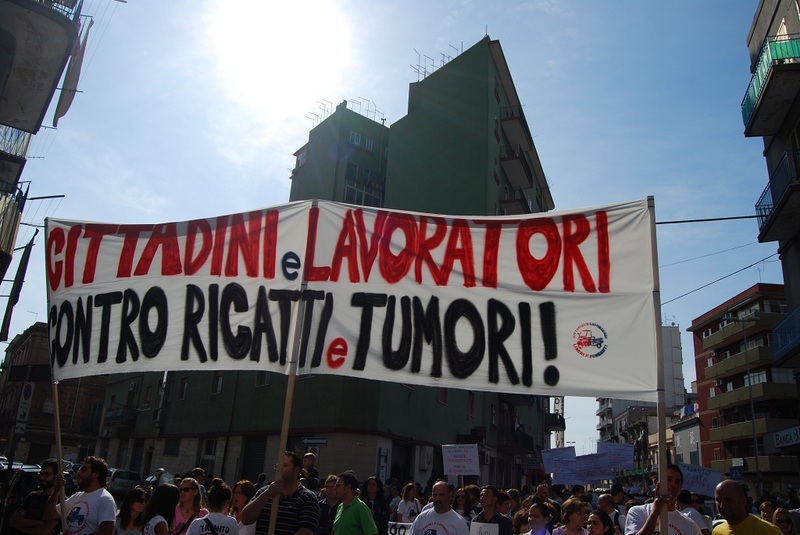 Workers at Taranto, Italy’s biggest steel works – which is threatened with closure under anti-pollution rules – are refusing the false choice between their jobs and their community’s health. The government, courts, trade union leaders and the billionaire Riva family who own the works are arguing over its future. The jobs of 11,500 directly employed workers and another 9500 employed indirectly, in a region with a 30% official unemployment rate, are at stake. But workers are not meekly following the union bosses’ campaign to keep the works open at all costs. They are rejecting the two-dimensional choice offered in the media, between keeping the plant open along with the deadly dust with which it pollutes the area, or closure and poverty. A group of them are arguing that it is “up to the state and the Riva family to pay for the consequences of the health disaster that they have created” by investing in new, cleaner equipment. They have formed a “committee of free and thinking residents and workers”, and have organised big demonstrations demanding health AND jobs. The initial threat to close Taranto came from a court judgement, delivered on 26 July, that the health hazards caused by the blast furnaces meant it had to close. There is little argument in the local community about the deadly character of the health hazard. An unusually high proportion of babies are born with respiratory problems; the local area, and the plant’s workforce, have a much higher rate of cancer deaths and leukaemia cases than the national average; and the local mussel farms have been abandoned. The most visible sign of pollution is a fine red dust from an uncovered slag heap that blows daily into homes and gardens. Nevertheless, when the court ordered the works to close, union leaders joined management to keep the works open – but at a big rally on 2 August, workers made clear that they want more than that. The newly-formed “committee of free and thinking residents and workers” raised their demand that employers and government find ways to tackle the pollution without making them and their families suffer unemployment. ■ Health – because the right to life knows no compromise. ■ Environment – because we will no longer allow the place where we live to be exploited and devastated in the name of profit. ■ Income –to guarantee a dignified existence to the workers and residents of Taranto, after fifty years of blackmail and pollution. ■ Jobs – because it is unacceptable that in a city so industrialised as this that there is 40% unemployment. The dispute over the future of Ilva is unresolved. On Friday 26 October, the environment ministry issued authorisation for the steelworks to stay open, with strict conditions to reduce dioxins emissions and clean up the plant, Reuters reported. How that squares with the court judgement in July is not yet clear – but it seems the bosses and government would probably like to keep parts of the works open. Maybe they will try to export the “dirtier” processes outside Europe. Right now, the Taranto community needs all the solidarity it can get. But already, that community has opened up a new avenue of struggle that has much wider implications. Refuse the false choice between health and jobs! say the workers and residents of Taranto. That principle could be applied to other workers in industries whose production damages human health or ecological balances. Refuse the false choice between coal communities and sustainable energy! Refuse the false choice between food security and corporate-controlled GM! And so on. Once we refuse these false choices, we will be better equipped to make real choices – and in the first place, to choose between workers’ movements that are constrained by trade unions to limited workplace issues, and workers’ movements that deliberately merge with wider social movements and address wider political issues (which seems to be what has begun in Taranto). A more general point underlies this. Whereas 20th century labour movements focused on resisting the employers’ appropriation of the products of workers’ labour, and on recovering what they could for workers, 21st century labour movements will need increasingly to challenge the very character of the labour process that workers perform – what they produce, how they produce it, and the impact on society and nature. Two hundred years ago, the Luddites, one of the first mass workers’ organisations in England, challenged technology that was “hurtful to commonality”. By doing so, they questioned the capitalists’ “right” to decide what technology was used, what was produced, and what damage was done to people and to nature in the process. Activists in the UK will mark the Luddites’ 200th anniversary with a series of events (see their web site here). One idea is to debate how the workers’ movement should think about the nature of work, and how it should tackle questions of technology and ecological impacts. The Taranto workers have given us plenty to consider during such a discussion. A leaflet by Mouvement Communiste, a group based in France that has been following events in Taranto closely, is downloadable here. From the People & Nature web site. This is a very positive development: please keep us updated! What's happening with this ?